(CNN) -- More than 200 migrants have been rescued from an overcrowded boat at risk of sinking in rough waters in the Mediterranean Sea, the Italian navy said Thursday. The alarm was raised on the evening of New Year's Day, when the boat was spotted about 80 miles south of the Italian island of Lampedusa. The boat, which measured only 10 meters (33 feet) long, was carrying 233 people without life jackets, the navy statement said. Given the rough seas and the boat's "precarious state of buoyancy," the decision was made to transfer the 233 people, seven of them women, to a navy ship, the San Marco. All were safely recovered, the statement said. The migrants, from Eritrea, Nigeria, Somalia, Pakistan, Zambia and Mali, were all moved safely, the statement said. After being transferred to a frigate, the migrants will be taken to the port of Augusta, on the Italian island of Sicily, where they are expected to arrive Thursday evening, it said. How do illegal immigrants get into EU? Meanwhile, the Greek coast guard has rescued 85 migrants -- including 15 children and 20 women -- after their boat got into trouble in stormy weather in the southeastern Aegean Sea. They were taken to a port on the Aegean island of Astypalea, where they arrived Thursday, the coast guard said. They are being given medical help, food and other emergency supplies, the coast guard said. Greece's semiofficial Macedonian News Agency reported that the migrants are Syrians and Afghans, but the coast guard has not yet confirmed their nationality. 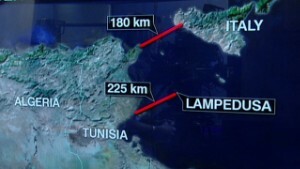 As the closest Italian island to Africa, Lampedusa is a frequent destination for refugees seeking to enter European Union countries, and shipwrecks off its shores are common. Many of the migrants are from African nations, while others have fled war-torn Syria. More than 300 African migrants died in October after their ship sank off the island's shores. Days later, another 34 people died when their boat capsized. Tens of thousands of people are rescued each year from the Mediterranean, according to the European Union border agency, Frontex. Smugglers often pack migrants into unseaworthy, ill-equipped and overcrowded boats, adding to the dangers of the journey. Between January and September of last year, 31,000 migrants are believed to have entered the European Union illegally by crossing the Mediterranean to land on Italian soil or the island of Malta, Frontex said. Opinion: What is place of outsiders in European society? Journalists Livia Borghese and Elinda Labropoulou contributed to this report.